These books showed up next to each other in my To Read shelf and actually inspired this post. They both use very similar fonts with a relatively similar color scheme, but Because You'll Never Meet Me uses a simple silhouette-on-gradient while What We Left Behind goes for a classic sky and lens-flare. While I like the texture in WWLB and the classic features, BYNMM wins for me because of the text art. 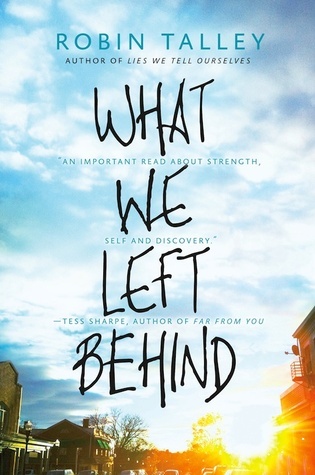 The tilted and askew placement of the title is simple but striking, as opposed to the rather flat title in WWLB. There's just more movement. Less is more, ladies and gents! 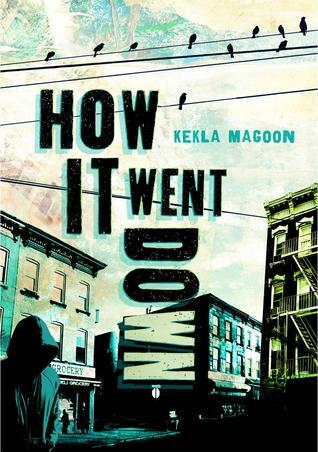 If you're going with the silhouette, birds-on-a-telephone-pole though, I think How it Went Down by Kekla Magoon does it best, with its posterized image, gritty texture, bright colors, and chunky text art. It's all about the accessories. But I didn't think it was fair to pit this complex beauty against the two simpler styles above. Who wore it better #1? Love the contrast between the colors. Personally, I prefer WWLB because of the brightness factor. It's interesting how similar these themes are, though. I wouldn't choose How It Went Down for some reason --- it just doesn't appeal to me. I really did like how bright WWLB was. I love getting different opinions; everyone is so different! 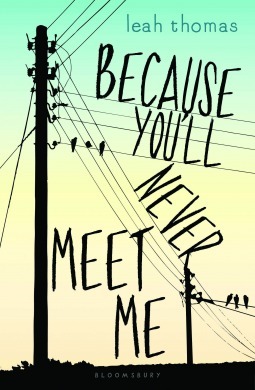 I'm definitely voting for Because You'll Never Meet Me, because I think it MEANS more!?! Like WWLB is pretty and I like the covers...but at the end fo the day, it's kinda just a generic sky?! Whereas the powerlines means something in BYNMM. XD Well that is just my deluded thinking anyway. heheh. Yeah, I had the same thought. The powerlines are really striking and give me a better sense of the book's setting. I also prefer BYNMM, but that's because I always like those sort of artsy, hand-drawn covers better :P.
And a while ago I saw the cover of Heir to the Sky (by Amanda Sun) and did a double take because it looked so much like The Accident Season from afar. Ooooh I'll go check those out!